One of the trends in academic publishing these days seems to be an effort to provide information in a more condensed, easy-to-consume fashion. There are series like "Short Cuts" and its brief books on various topics in film (such as on New Korean Cinema). There also seems to be an explosion in publications of various handbooks or companions to this or that subject. I participated in one with my article on ”Japanese Film and Television" in the Routledge Handbook of Japanese Culture and Society edited by Vicky and Ted Bestor and Akiko Yamagata; and in another with the piece "Nation, Citizenship and Cinema" in A Companion to the Anthropology of Japan edited by Jennifer Robertson. Daisuke Miyao, ed. 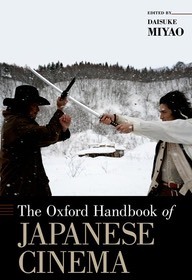 Oxford Handbook of Japanese Cinema. Oxford University Press, 2014. ISBN 9780199731664. A couple of years ago, I wrote a review of Tokyo FILMeX's "Nippon Modern" retrospective of Shochiku films from the 1920s and 1930s for Undercurrent, the online journal of FIPRESCI. It was a critical take on not just the retro, or even Sato Tadao's article for the catalog, but of a longer history of Japanese critics and institutions declining to think sufficiently about Japanese film history, in part by not thinking about the history of thinking about cinema in Japan. The piece was another in my efforts to think about the history and problems of film theory in Japan, which I mentioned in my last entry. The Undercurrent article caught the eye of Alex Marlow-Mann, who asked me to expand on it for a volume in the "Film Festival Yearbook" series put out by St Andrews Film Studies. 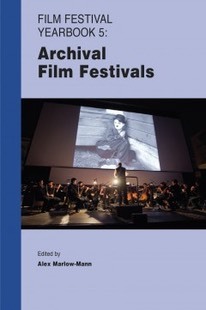 This volume, number five in the series, was on archival film festivals. My piece, entitled "Retrospective Irony: Film Festivals and Japanese Cinema History," sketches the history of retrospectives of Japanese film originating in Japan, beginning with those organized by the Kawakita Nagamasa and his wife Kashiko (the Kawakita Memorial Film Institute), and explores what kind of Japanese cinema they were constructing, especially for a foreign other. As with the Undercurrents piece, I note how these retros frequently did construct a Japan or Japanese cinema that was itself not supposed to be the object of critical theory, even when these events were held at home.